Toronto nutritionist provides a short list of top foods that have been successful in helping her clients lose weight throughout the years. Read more. How to lose weight is probably the single most common question in people’s minds when it comes to nutrition, health and fitness, at least when they see a nutritionist. Many articles and blog posts have touched on the topic. Numerous infographics have been made. Countless videos have been shot. And an untold number of books have been written about weight loss and related matters. Obviously, a great deal of information exists out there, much of it conflicting and invariably changing. Eat this, don’t eat that, eat low carbs, eat high protein, and so on, and so on. How is anyone supposed to sort through all this information and make any sense out of it so as to help him or herself? From my many years of first-hand experience as a nutritionist, I compiled a short list of foods that have been effective at helping my clients lose weight while making them feel better overall. Ask anyone who is trying to lose weight and I can virtually guarantee chicken breast is part of his or her diet. And I can also virtually guarantee that he or she will say that chicken is boring. As dull-tasting as chicken may be on its own, its benefits of chicken are enormous. Chicken breast is lean, high in protein and has zero carbohydrates, making it a popular go-to staple when trying to eat healthy or when trying to lose weight. For those of you looking for ways to spice up your breasts, cook it with bone in and skin off. Keeping the bone in while cooking will make it more juicy and tasty. Marinate in lemon and olive oil, fresh herbs or a healthy, low-sugar or low-salt, preferably preservative-free sauce such as Mr. Spice, if you just must have more flavour with your bird. Another popular choice among dieters and people who want to lose weight: eggs and egg whites. Forget the old wives’ tales of eggs being unhealthy. This is 2018 and numerous studies have been conducted since the days when eggs were vilified. Eggs are low in calories and contain high quality protein, which helps your muscles to recover, repairing them after strenuous physical workouts. You don’t have to avoid the yolks either; just don’t eat a dozen of them at once. Ideally, opt for one egg plus two egg whites. This way you keep the flavour with less fat—perfect for those looking to lose a little weight. 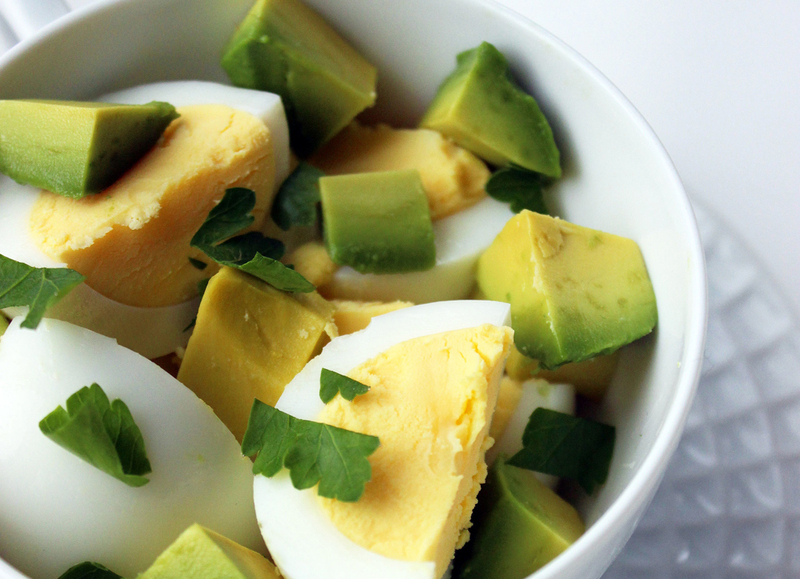 If you need more flavour, add salsa and/or sliced avocado to spruce up your eggs. You’ve heard this one before: eat vegetables because they do the body good. There is an excellent reason why you’ve been told this by everyone from your mother to your favourite nutritionist: it’s true. And if you’re going to eat vegetables, the greener the better! Most vegetables are full of water, fibre and antioxidants—all essential elements that contribute greatly to healthy weight loss and weight maintenance. Vegetables are also low in calories and low in carbohydrates, making them ideal companions of those looking to lead a healthy lifestyle. There is no need to watch your portion sizes with greens either. In fact, the more greens you eat, the fewer starchy carbs you will likely eat, and that in itself can lead you well on your way to weight loss. Here’s just a short list of excellent green vegetable choices that you should seriously consider in adding to your regular diet: broccoli, kale, spinach, zucchini and bok choy, to name a few. There are those who denounce the use of protein powder and those who swear by it. I fall somewhere in the middle of this spectrum. While I feel that protein powder should not form the centrepiece of your daily diet nor should it be your mainstay protein source, protein powder can be beneficial to someone who is trying to lose weight. Remember, protein keeps you full for longer. It’s a simple truism: if you’re full, you’re less likely to eat. Taking in a scoop here and there with water or in a healthy fruit smoothie can help stave off hunger, allowing you to refuse those unhealthy office treats that seem to make an appearance every morning coffee break. If you decide to resort to the use of protein powder, I recommend using a high quality whey isolate or yellow pea protein. It is important to remember that it’s best to avoid whey if you are sensitive to it, digestively speaking. Protein shakes and smoothies are a convenient, great-tasting alternative to meat protein. Many brands have now become available, but beware that many contain fillers and lack quality protein. Some contain ingredients such as sugar, that are naturally counterproductive to weight loss, so analyze those lists of ingredients with due care. Feel free to contact me and I can point you in the right direction as to what brands can best suit your personal needs. Some nutritionists may knock me for including the protein bar on my list, but many of my clients include protein bars in their regular diet and lose weight. Certain protein bars offer some variety to the run-of-the-mill protein sources consumed in a meal plan. They can also act as a ‘treat’, which can satisfy cravings for sugar and prevent reaches for unhealthy snacks. Realistically speaking, when someone is pressed for time or on-the-go, high quality protein bars are an excellent snack choice. Consider your options: A chocolate bar full of sugar, zero protein and empty calories, or alternately, a protein bar that provides you with next-to-no-sugar and some nutritional value, helping to tide you over? The choice has to be the latter, if you’re serious about losing weight. Of course, better, more nutritious snacks exist. Plain yogurt and nuts is one case in point that springs to mind. But are you really going to pull out a yogurt and a spoon, and start eating it on a jam-packed subway or in your car during rush hour? Not likely. Make a high quality protein bar your go-to, on-the-go friend and it will go along way in helping you stick to your goal. Not sure which one to choose? Ask me for a recommendation. Do you have a comment or question? By all means, feel free to post. Julie Mancuso is a registered holistic Toronto nutritionist who has been counseling clients for over 15 years. Julie’s personalized approach has helped thousands reach their health, wellness and nutrition goals. Julie’s blog has been named one of the Top 100 Nutrition Blogs, Websites and Newsletters to Follow in 2018 by Feedspot. So don’t miss out and subscribe to both her newsletter and blog. Toronto nutritionist and weight loss expert receives high praise for the success rate of her personalized approach. Three locations: The Junction, Midtown Toronto, Woodbridge and Vaughan. Also servicing Durham Region: Pickering, Ajax, Whitby.